The tactical Atomic Lighter is the fuel-free, rechargeable light that works anywhere, anytime. The secret is lightning bolt technology; see how the plasma arc technology create fire without gas or butane. Just press the button and it lights the first time every time. 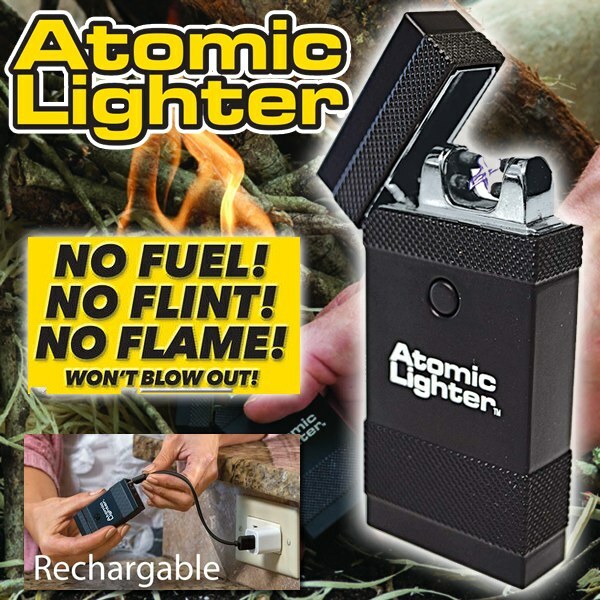 The Atomic Lighter won&apos;t blow out like other lighters. There&apos;s no flint so even if it gets wet it still lights. This tactical lighter is shock resistant, water resistant. Features easy open latch, charge status indicator, no fuel design, charges via USB and is slim and lightweight. Get over 100 lights on per charge. USB rechargeable battery so it&apos;s always ready to go. Great for lighting the grill, campfire, candles, cigars, cigarettes or cleaning up rope end. Works great! Easy to charge.